One of the most important items of koi keeping is feeding the correct koi food in the correct season. Once this is determined and mastered, the koi will advance much faster and retain the beauty for a longer period of time. Koi are works of Art and as such in nature need the proper food at the proper time. Fujizakura has proved to be even better than expected when it comes to health. Many of the breeders have now began feeding this to their koi for the health benifits. Personally fed at the Cotskoi Farm, JPD Shori is an excellent food that really makes the body of the koi robust and has very low waste levels. Best growth food on the market today thanks to the added Probiotics! 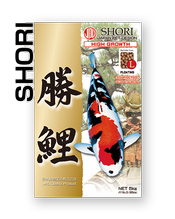 Personally fed at the Cotskoi Farm, Shori is an excellent food that really makes the body of the koi robust and has very low waste levels. Best growth food on the market today thanks to the added Probiotics! 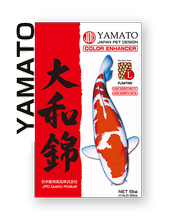 Yamato is a great maintainence koi food for color and shiroji. 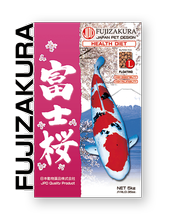 The lower protein levels allow the koi to focus on the beauty as opposed to the growth. Great semi staple food thru the summer.